Monuments decorate the Northwest New Jersey in prominent and tucked away places. They are statues and plaques, fine-crafted or natural rock, some are pedestaled and others are so discreet as to appear part of the natural landscape. They all commemorate a part of your history, usually with a fascinating story about an unusual person or event. 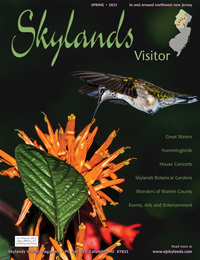 Seeing them brings more than just a visual connection ­ the visitor gets a sense of a real person who lived, accomplished, and died in the stream of life. John Basilone monument in the Borough of Raritan. It is impossible to mention more than a handful here, but check with county and local historical societies for more information on other monuments. A devotee and expert on the topic of each memorial exists somewhere ­ you must hunt for them. Many monuments commemorate a person or place in a war. So, move over Rambo for the real blood and guts World War II superhero, Gunnery Sergeant John Basilone of the United States Marine Corps, also known as "Manila John," "the man who changed history in three days," a Marine's Marine," and "a one-man army." 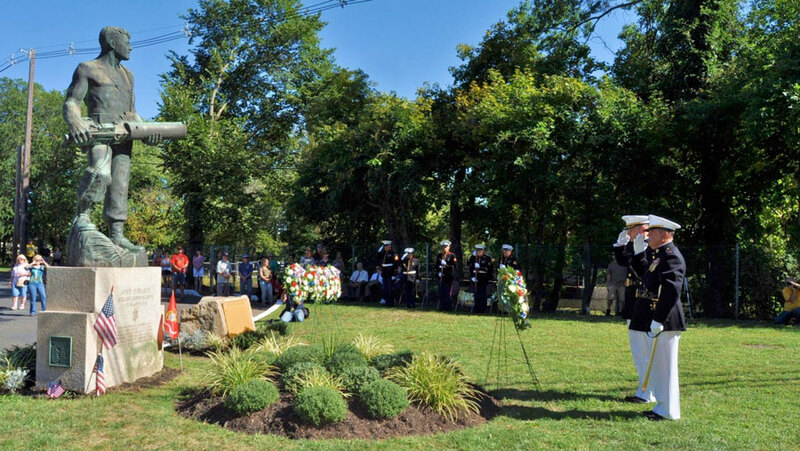 Basilone reigns in the Borough of Raritan with a bronze monument, on Basilone Day with an annual parade every September preceded by a concert with a national military band held at Raritan Valley Community College, a biography, and a museum in the Raritan Library. His statue, sculpted by a boyhood friend and installed in 1948, stands larger than life ­ like the man - on a little triangular intersection on Somerset Street. His countenance graces a 2005 US Postage stamp and the cover of Life magazine. Bridges, highways and legion posts are named after him. "He really turned the tide of the war in the Pacific to ultimate victory," says John Pacifico, chairman of the Basilone Parade Committee in Raritan. At Guadalcanal in 1942, Basilone annihilated the Japanese regiment that outnumbered his men by three or four to one. Most of his men were killed, leaving only him and two others holding the line for three days until replacements arrived. During that time, Basilone repaired guns and kept his machine gun firing, ran with his 90-pound weapon to the gun pit of his dead crew, and when attacked from behind, he killed 38 enemy soldiers with his Colt 45 pistol. Basilone snuck behind enemy lines to get ammunition for his and his men's guns. He ran back and forth to his two men, repairing weapons and supplying ammunition. When Johnny came marching home again, he received the Congressional Medal of Honor and traveled the country on a war bond tour. Three years later he enlisted for Iwo Jima. "In 1945 he was killed in the first wave of Iwo Jima. No other recipient of the Medal of Honor has ever returned to war or received the Navy Cross," says Pacifico. Not far away in Bound Brook, a two-ton boulder dug from the sands of an ancient sea that once covered New Jersey supports the Battle of Bound Brook Monument. From time to time, it disappears to decorate another part of Bound Brook, the oldest town in Somerset County. This rock has rolled around town five times, to the surprise of most. The million-year-old boulder was dug out of the Raritan River or Delaware & Raritan Canal (depending on the account you read) in 1834 when the canal was being excavated. It stayed on the side of the canal for 63 years before the town made a monument out of it. First it was placed on Lincoln Boulevard at the site of the former house where American troops leader, Benjamin Lincoln, lived until he and his 500 men fled from 2,500 British during the American Revolution. Years later, the town decided that the monument impeded traffic so they moved it to the old Borough Hall a few blocks away. Because the plaque states it marks the spot of the 1777 Battle of Bound Brook, they thought they'd better move it near the spot. So the rock moved to the Pillar of Fire School. When the townspeople made a park out of the old Presbyterian Church Graveyard in 1976, they brought the monument in, dropping it right from the bucket of a front end loader. Twenty-two years later they rolled it down the road to its current spot, Billian Legion Park on Main Street. "It's back again now, sort of in the vicinity," says Mary Nelson, adult services librarian, Bound Brook Branch of the Somerset County Library. But a second mystery surrounds the monument. Only one of its original two cannonballs, found on a local former battlefield, is still attached. An English gentleman owned the other cannonball and gave it to the Reverend of the Presbyterian Church. Questions remain: Where is the other cannonball? Will the rock roll again? "I don't know and I don't know if anyone knows, but it's missing," Nelson says. "They fixed up that park. It's probably got a permanent home." No story about monuments would be complete without mentioning General George Washington. Although he is widely acclaimed throughout New Jersey and Pennsylvania, this bronze statue of Washington and his stallion commands attention. The horse's beauty and strength, the man's sensitivity, responsibility, and strength of character have been well-defined in detail and confidence. This is a must-see piece of art that depicts the quality of a president who actually fought beside his men and personally led them onward. The bronze is located in a triangular plot at the junction of Morris Street and Washington Avenue in Morris Plains. The statue, sculpted by Frederick Roth and cast in Italy, rests on a granite pedestal under elm trees on the spot of his bodyguard's hut, across the street from Washington's headquarters at the Ford Mansion. 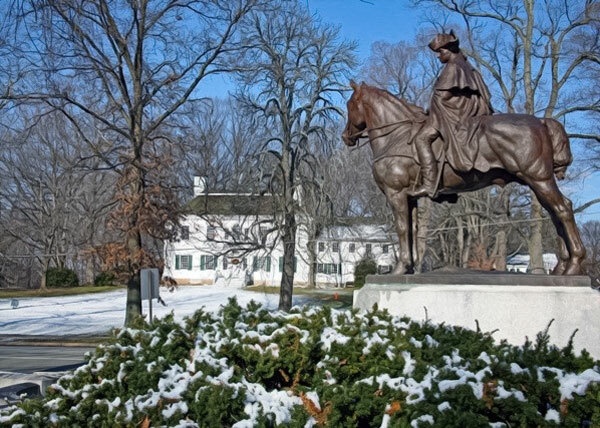 This statue forces contemplation and awe ­ of the general, horse, sculptor, and Miss Ellen Mable Clark, donor, who made her childhood dream of giving Morristown a statue of George Washington come true. George Washington at the Ford Mansion and Francis Asbury at Drew University. 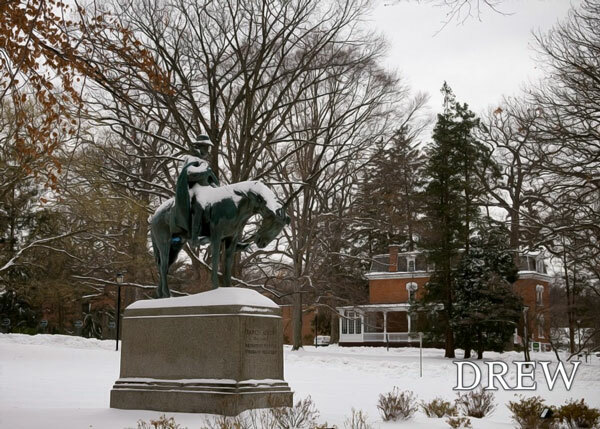 The Equestrian Statue of Francis Asbury, itinerant preacher, at Drew University in Madison, is sure to enlighten and console. Asbury, a circuit rider also known as "The Prophet of the Long Road," was among the first to spread the word of Methodism in America in 1771. It is said he rode over 275,000 miles on horseback to preach and organize the new "religion of the frontier," which had its beginnings in England. For 45 years he traveled from Maine to Virginia through the untamed landscapes of those times with his original five helpers becoming 700. Through his teachings, about 210,700 people adopted the new religion. But Church did not respect State and many new followers fled when the British John Wesley, founder of Methodism, blamed the colonists for the American Revolution. Asbury remained true, however, to both his calling and America, the new nation. The monument was a gift to Drew University, founded in Methodism, by trustee William D. Pilling in 1926, in memory of his brother, Reverend Edward S. Pilling. In Butler, a monument of a fantasy kind awaits the Skylands visitor. The six-foot "Wooden Fireman" found a new role among New Jersey citizens when Butler firemen rescued the statue from a junkyard in 1909 after it was ousted from a Newark insurance company. They loaded him into their horse-drawn wagon to bring him back to Butler. Along the way, firemen from Bloomfield ambushed the rescuers and tried to take the statue for themselves. The Wooden Fireman lost a leg in the skirmish, but a local carpenter made him a new one ­ a second left leg. Today he stands on the balcony of a Butler firehouse, forever on guard in his new home. 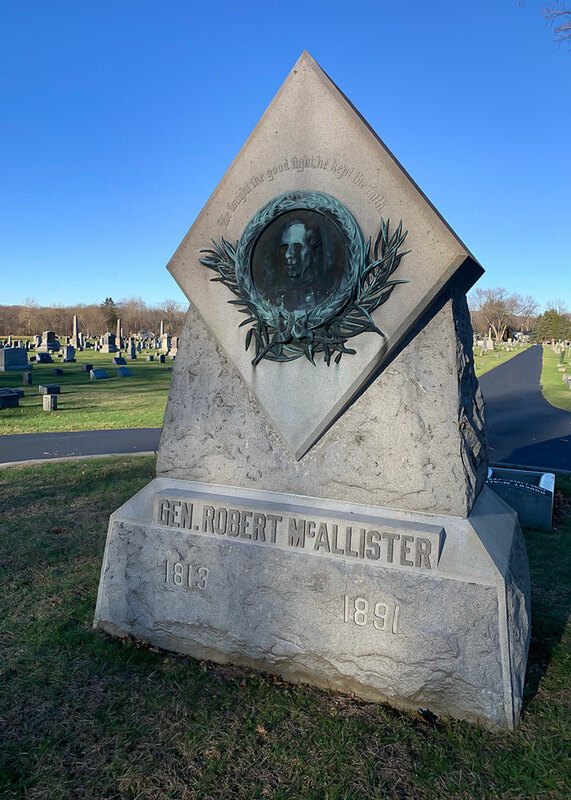 On the western edge of Warren County, the 1890s General Robert McCallister monument in front of the Belvidere Cemetery is a stone in the shape of a diamond that symbolizes the Third Corp of the Union Army, the unit he served in. McCallister, an engineer, built the railroad tunnel through Tunnel Hill in Oxford during the Civil War. But perhaps this story best describes his personality. "He was a very religious man and was opposed to drinking," says Andy Drysdale, curator at Shippen Manor, a Warren County Cultural & Heritage Commission site. "When he was wounded at the Battle of Gettysburg, they tried to get him to relax to operate on him." They used alcohol in those days, so he refused. They spiked a milk punch and operated. "The general was heard praising the quality of milk from Gettysburg cows." In Newton Square, an eight-foot tall granite Union Soldier stands at rest, holding his musket. This 33-foot, 90-ton memorial, inscribed with battles where county soldiers fought, was erected by the citizens of Sussex County in 1895 at a cost of $5,600. The monument reads "Erected by a grateful people to commemorate the services and sacrifices of the soldiers and sailors in the war of the rebellion. Defenders of the Union 1861-1865." Chaos surrounded the memorial's history. Bounty jumpers and hunters, "skedaddle rangers," an unpopular president and unfair draft, bribery, unscrupulous brokers who bought and sold draft substitutes, and an attempt to shoot the preacher in the Branchville Presbyterian Church as he read his poem, "The Devil in Dixie," all fueled the excitement of the "unholy rebellion" of the Civil War.